Share https://www.matrix.com/biolage/raw/raw-products/styling/raw-texturizing-styling-spray R.A.W. Texturizing Styling Sprayhttps://www.matrix.com/~/media/images/haircare/biolage/raw/2018/biolage_raw_texturizing_styling_spray_2.jpg Gives separation and definition for touchable texture. 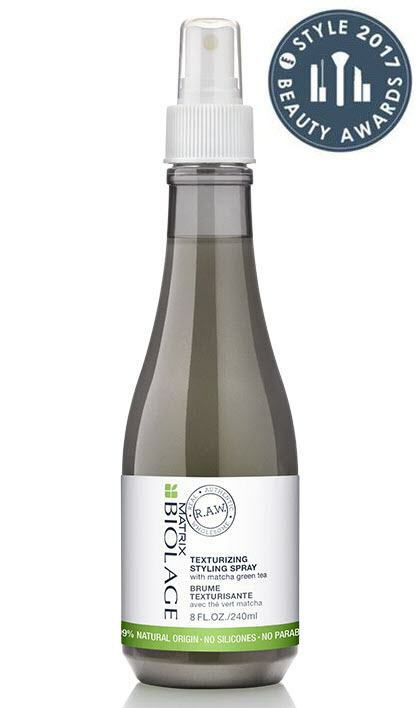 Infused with matcha green tea, this texturizing styling spray gives separation and definition for touchable texture. For loose beach waves with soft feeling and movement. Aqua/Water, Sodium Chloride, Magnesium Sulfate, Glycerin, Polyglyceryl-10 Dioleate, Sodium Benzoate, Salicylic Acid, Sodium Hydroxide, Camellia Sinensis Leaf Extract (Matcha Green Tea Extract), Dextrin, Tocopherol. To use: Shake before use. On damp hair, spray evenly. Tousle and let air-dry or use a diffuser. For added texture, spray on dry hair. Style as desired.